Part of the process is cooking the curds, bringing them all the way up to 120F degrees -- by far the highest temp I've had to hit for cooking curds (cheddar only neeeds to go to 104F). Then there's the stirring...and stirring... and stirring. I was definitely happy to make use of my motorized stirrer! 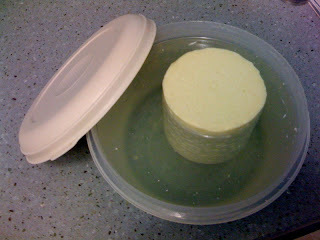 Pictured above is the cheese after pressing overnight, floating in a saturated brine solution. Tonight I'll take it out of the brine and start aging. The aging is a bit more specific on this one: One week in the cave (50-55F, 85% humidity), then 2-3 weeks at room temp, and then back in the cave (45F, 80% humidity) for at least three months. No wax on this one, either, so it'll be interesting to see how it fares. I'll keep you posted, of course! So is this going to be "emmental" or "gruyere" swiss cheese? Perhaps more of a "Beach Swiss." I am so impressed by your patience. All my cheeses have been ready within a few days. I don't know if I could wait weeks and weeks! I'm going to look around on your blog and see how you've done with feta. My experiments have not been all that good. Als0--just started reading Goat Song last night. The writing is really beautiful and now I have big time goat envy! Well, so far the Swiss is causing me some major strife. I'm at the second aging step -- out of the cave and onto the kitchen counter for 2-3 weeks. I'm about 10 days into that, and there's tons of mold growing on the surface. There's a brown/black mold and a white/blue mold. It doesn't really wipe off, and even scraping with a knife only removes part of it (it's under the surface now, unfortunately). I've just emailed cheesemaking.com to ask their advice. Hopefully they'll come back with something brilliant! Hmmm, maybe room temperature doesn't mean to leave it out open in a room. The bacteria is anaerobic and so you should be able to sanitize a container and seal in your cheese while at room temp. This will at least keep off the wild molds and yeasts while sitting on a counter-top. Your "cave" will also have problems with wild molds. I actually had it sitting on a cutting board, *inside* my stainless steel pot. I also had a small cup of water inside the pot (to keep the humidity up a bit--no doubt that didn't help), and kept the lid on the top (opened just slightly). Had it had a smooth surface, it wouldn't have been a big deal--just removing a little bit of mold each day would've solved it. But since it had lots of nooks & crannies when it came out of the press, the molds really took hold. I ended up using a cheese slicer to shave off the outside. Ended up with a much smoother surface (and sadly, less cheese). Now the only problem is that I am out of town and had to leave it alone. It's in the cave, so the lower temp should help retard the growth, but I'm pretty sure it'll be completely covered by the time I get home. Dang. So I know all of you are on the edge of your seats about how the Swiss turned out. The mold really took hold on the surface because the surface wasn't smooth. The Curds were a bit too tough when I pressed it, and didn't knit into a totally smooth surface when they came out of the press. (Click on the photo of the cheese in the brine for a larger view, and you'll some of the texture I'm talking about). Once the mold got into all those nooks & crannies, it was impossible to get rid of by wiping it off. I took a cheese slicer and just shaved off the outer layer of the cheese -- taking all the mold with it. Unfortunately that meant I lost a fair amount of cheese, but there was definitely still enough left to continue aging. After aging for about a month in the cave. I decided it was time to take it out and sample it. The cheese seemed to be drying out (I'm still unable to get the humidity up beyond about 65%... even though it should be more like 85%), and I was afraid that the whole thing would just become too dry and inedible. The outer 3/8" or so was pretty dry, but the inside was creamy and moist. There were indeed some small holes in the cheese, but they were more like the small holes in a havarti rather than the large eyes of a swiss. The flavor was nice, albeit extremely mild. Another month or two of aging would probably have helped that! So there's the scoop. I think I'll continue waxing my cheeses... They're more likely to come out unscathed! I've read that many people have pretty decent success with vacuum bagging their swiss during the p. shermanii development stage. The vacuum bags keep the mold out, but stretch more than wax to acommodate the growth of a swelling Swiss. I have not *personally* tried this yet, as I'm only on my first swiss myself, but I thought I'd mention it. Thanks for the tip -- I've got a vacuum sealer, and I'll definitely give this a try on my next Swiss! When you try it, by all means please report back and let us know how it worked! I vacuum bag all my cheeses now. I've lost too many to mold! That will also help you with humidity. My problem in Seattle is I have too much humidity so I need to dry them really well before bagging. Good luck!